The spectrum of experiences as depicted in Survival and Other stories is a must read for students and scholars of Dalit and caste studies, development studies, Indian Literature in Translation, and gender studies, as well as the general reader. Categories: Fiction, Orient BlackSwan, Short Stories. Tags: 9788125045106, Bangla fiction, Bengali Dalit fiction, Bengali fiction in translation, Caste, Dalit authors, Indian fiction, Indian fiction in translation, Sankar Prasad Singha. ‘An eternity of oppression’ has defined the lives of Dalits. Yet they survive, resilient and defiant. 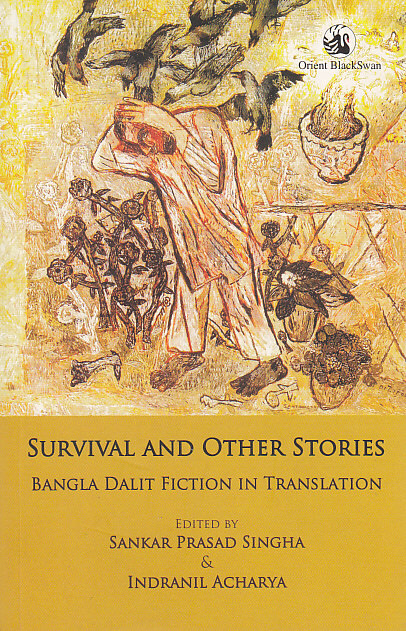 Drawing on the works of Dalit writers, Survival and Other Stories is a collection of Bangla fiction in translation, that speaks of Dalit lives lived on the edge and of suffering, negation and revolt. A mason is tortured for claiming equality with ‘upper-caste’ people but he refuses to yield. A ‘gunin’, or witch doctor, holds a woman responsible for the illness of her grandchild; her son kills her but the child dies, so the man kills the gunin too. A zamindar repeatedly taunts another for his ‘lowly’ ancestry: the latter forces him to drag a plough—replacing a bullock. A penniless man, woman and child wage a fight for survival with a poisonous snake: it is coiled up in a hole full of grain. A proposal of marriage from the progressive-minded son of a corrupt politician is turned down by his ‘low-born’ lover believing that society is not ready to accept their union. A stick-wielding hireling of landlords, and later of a political party, learning in old age from his erstwhile Muslim adversary that they had been cynically exploited, reluctantly accepts his friendship. Evocative of the indignities heaped on the Dalits, these stories are insightful and perceptive. They are a sensitive retelling, that retains the rhythms and idioms of the original Bengali narratives. The spectrum of experiences as depicted in these probing and absorbing stories is a must read for students and scholars of Dalit and caste studies, development studies, Indian Literature in Translation, and gender studies, as well as the general reader. Each story has a glossary with meanings of non-English words at the end.